You are currently browsing the tag archive for the ‘knitting’ tag. I’ve made a nice little camera case. It’s been a few months in the making simply because, unlike wet felt, knitting doesn’t need to be finished in one go. This came about because my mum gave me her odd ball stash. I loved this wool (all I know is that is 100% wool) and the naturally dyed colours so decided to initially make a bag for a little girl. I didn’t follow a pattern (or bother with a tension square – I know I’m lazy 😉 ) and didn’t cast on enough stitches so had to turn it into this camera case! 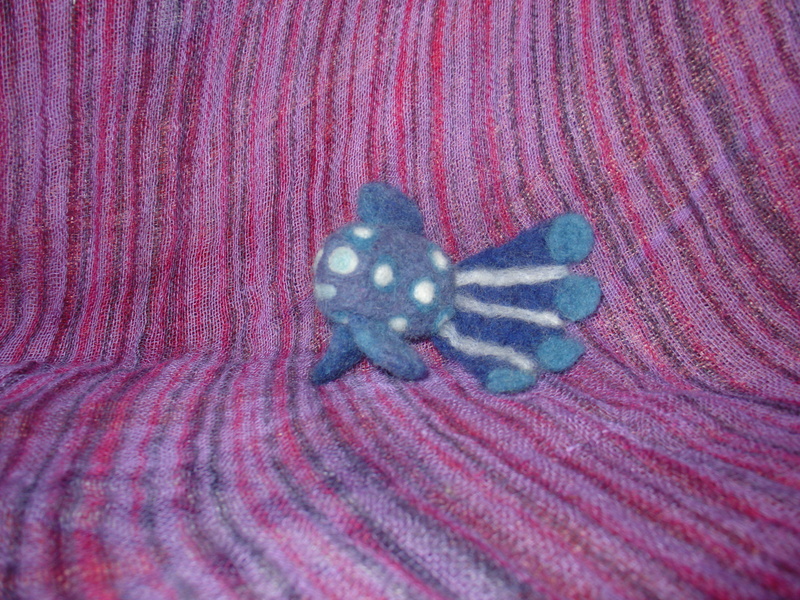 It was a very good excuse for me to practice needle felting onto knitting as it isn’t something I’ve tried but have wanted to for ages. 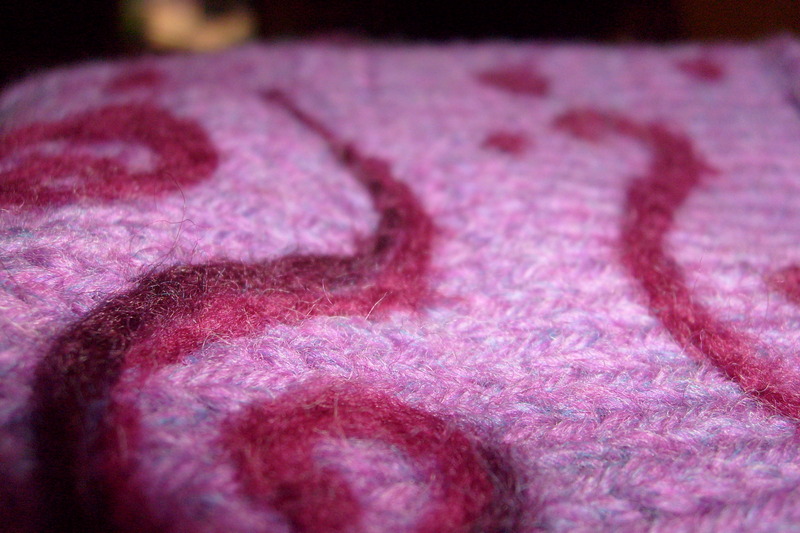 Next time I will be wet felting into knitting as I’m really excited to see what effects I’ll be able to achieve! 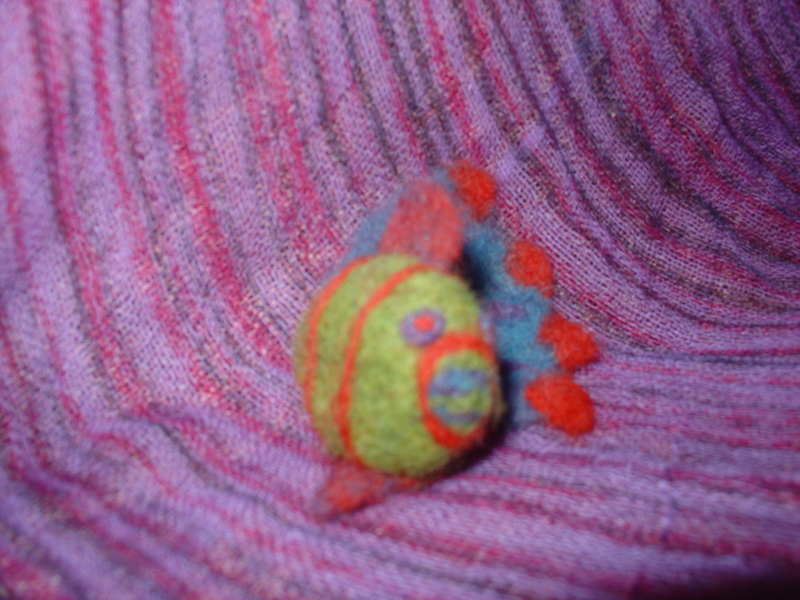 I used more natural fibres to needle felt into the knitting. I’m not sure what breed it is but it is naturally dyed roving. I would not use tops for this type of needlefelting because I reckon the extra ‘stabbing’ required would cause the knitting to pucker too much. Using roving minimises the amount of poking needed. I still need to add a closure, and perhaps a lining (not sure yet). The closure will probably be a crocheted cord and a big button. This is the bag my Mum is using as her handbag at the moment, and I have to say is definitely my favourite – it’s gorgeous! 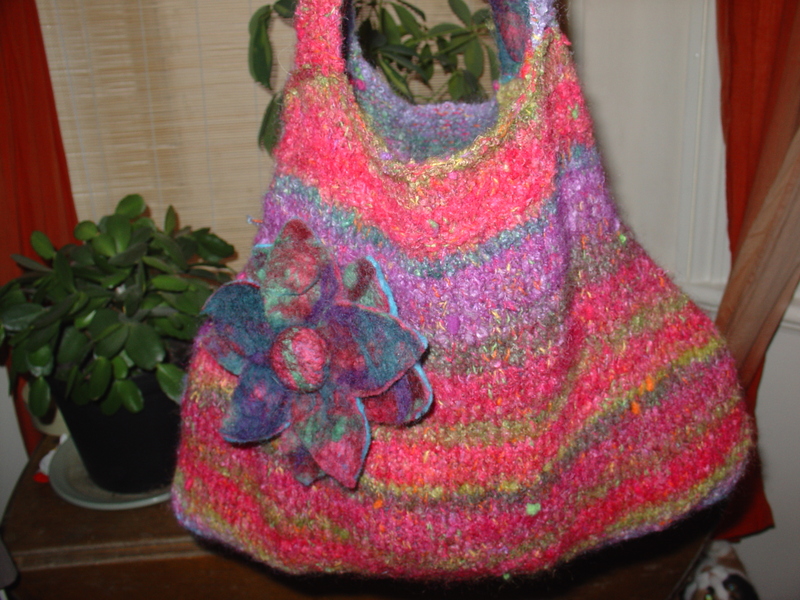 It was knitted in Noro Blossom yarn and has a felt lining, inside pockets and flower that I wet felted for her (with the exception of the center of the flower which is needle felted). I was a bit annoyed as in my opinion I hadn’t felted my parts well enough, although she’s very happy with it. I will know for the future though. 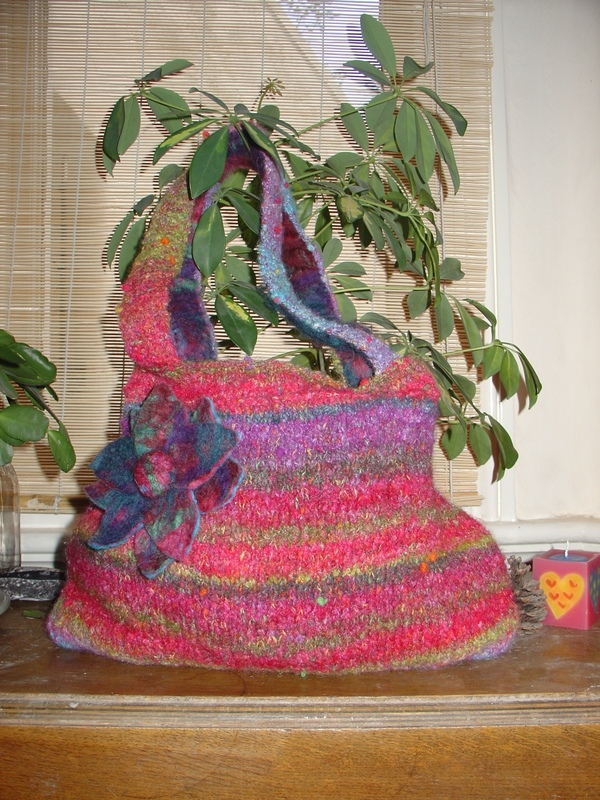 Next up is the bucket bag which she knitted in pencil roving and then felted. 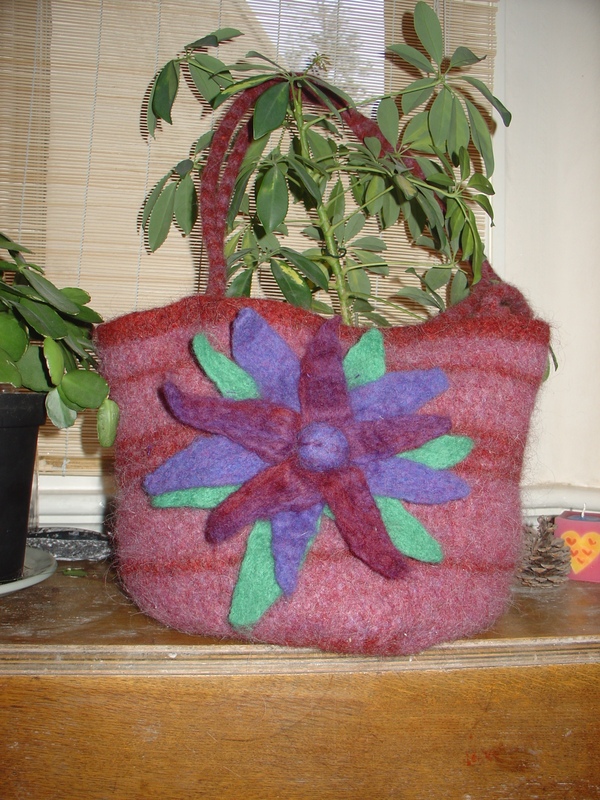 It has a needle felted flower on the front but the colours on the photo aren’t truly representative (nor are those on the Noro bag pictures but they are much much better). As I mentioned, my Mum came to stay for the weekend. I am lucky enough to have a great little wool shop just round the corner from me (it’s called Cocoon and is in Hove and worth a visit if you’re in the area). 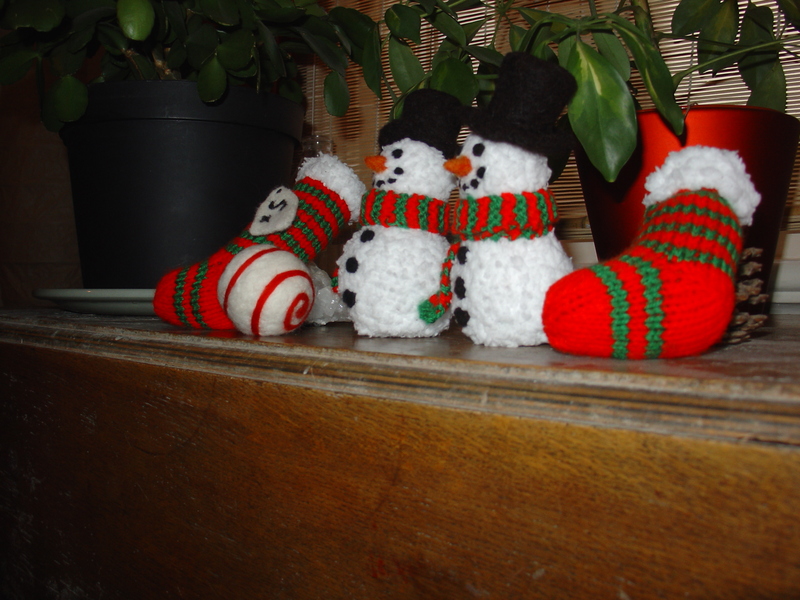 As usual we went and had a look there yesterday and after being disappointed by the fact that they didn’t have patterns for the knitted Christmas decorations in the window found a Sirdar pattern book for an advent calendar and lots of knitted decorations. 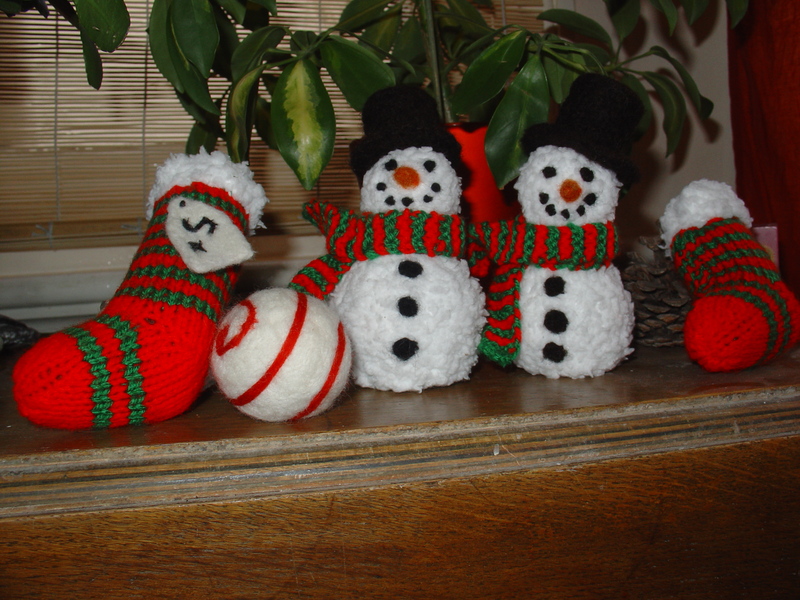 So last night she knitted 2 snowmen and 2 stockings, whilst I needle felted the snowmen’s hats and eyes, carrot nose, mouth and buttons and also a felt ball for the Christmas tree (of which I hope to make more co-ordinating ones). 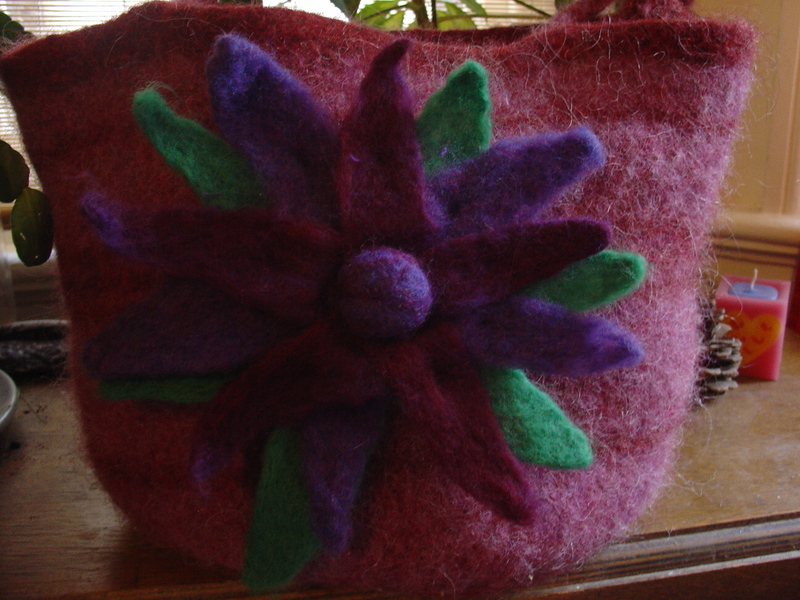 Talking of felting, I also told the owner of Cocoon how to wet felt (or at least I do, she mentioned she had olive soap already for doing it with but I don’t know if she’s tried any yet) after she was admiring my Mum’s knitted handbag with a felt lining and flower I made (photos to follow in next post). Maybe one day she’ll supply wool tops…here’s hoping! I made the tag on the bigger stocking in a bit of a hurry today before she left, so it’s not perfect but I think it looks nice on there. 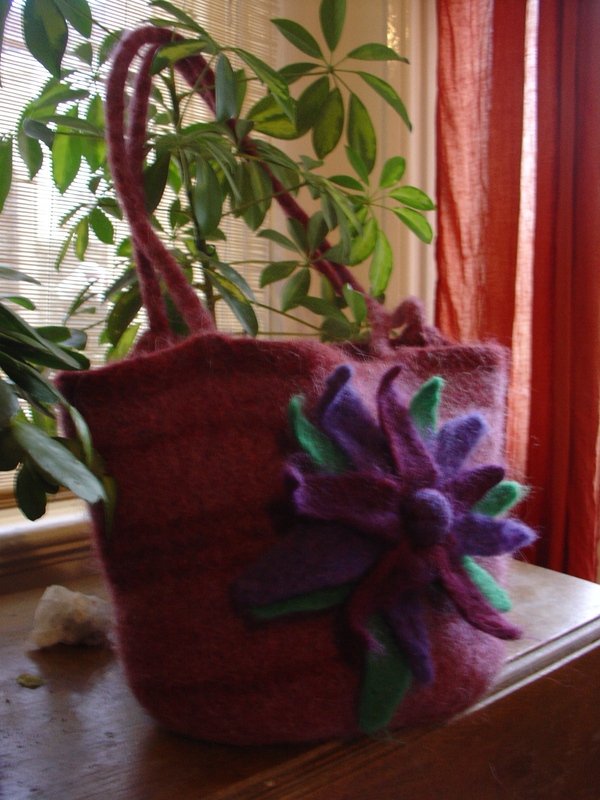 My Mum’s down for the weekend visiting, hence lots of woolly activities going on – as I write this she’s sewing one of my felt flowers onto one of her knitted and felted bags! Anyway one of her friends from the knitting group she goes to has written this funny list, so I’m putting it on here – thanks Cas! Wow, Ally Pally was certainly an exhausting day out! It was a great day and I’m so glad I went as I’ve wanted to for ages, but I was decidedly disappointed with the lack of felt making supplies on offer. I did come back with a few lovely bits and bobs, and huge amounts of encouragement and inspiration though, which I will show you just as soon as I find the charger for the camera! Update: I’ve been busy working for the past 20 hours, but will dig for the charger tomorrow. 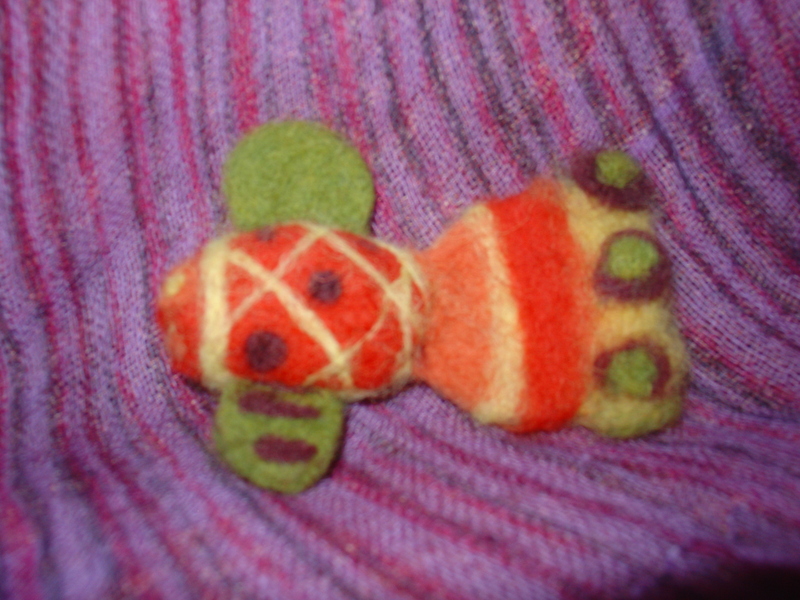 I’ll also upload the photo of the felted soap if I remember! 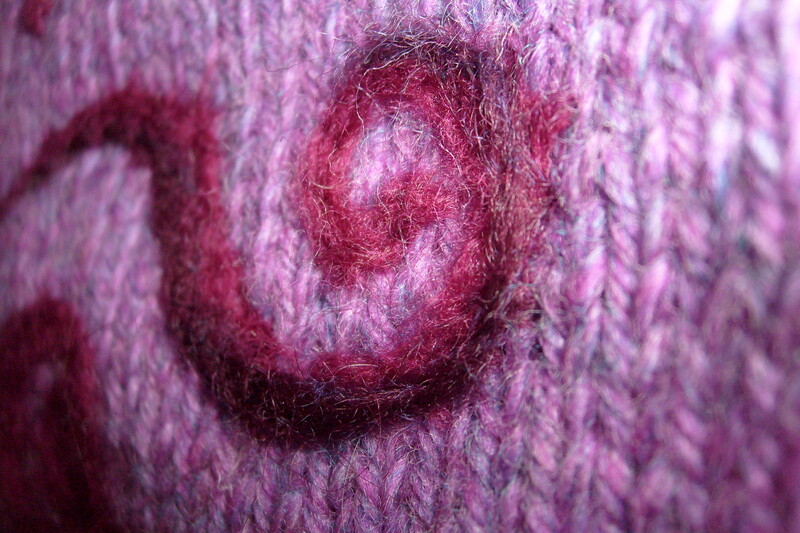 The 3rd of October 2009 is the first international day of Felt. They are running a competition based around the theme of Red, Yellow and Orange and there will also be international guerilla felting taking place. My guess is that the idea was born from the guerilla knitting that has been taking place for quite a while now (hardly Sherlock Holmes, am I!). Do a google images search, it’s great! I’ve been wanting to do some street felting ever since I first heard about the knitting craze, and am glad that someone more influential has actually done it! According to the website, today is the London event which I am sure will be absolutely amazing. Wish I could have taken part but can’t wait to see the photos! I only have scraps of yellow and orange fleece, and no red at all but I’m sure I will be able to make something for the 3rd. I’ll probably tie it to the dog rose bush in my front garden. We live in quite a busy road in the city so hopefully lots of people will see it (and it won’t be raining!). 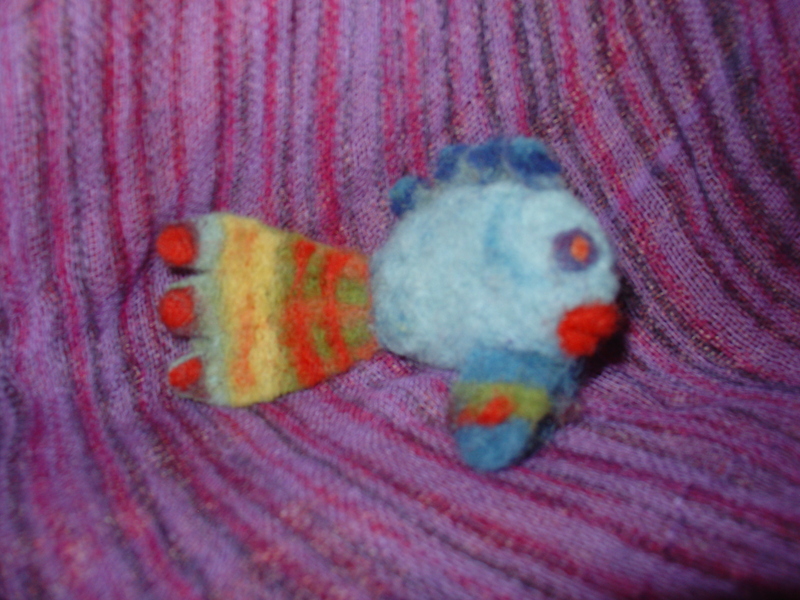 Perhaps some needle felted birds…we’ll see. 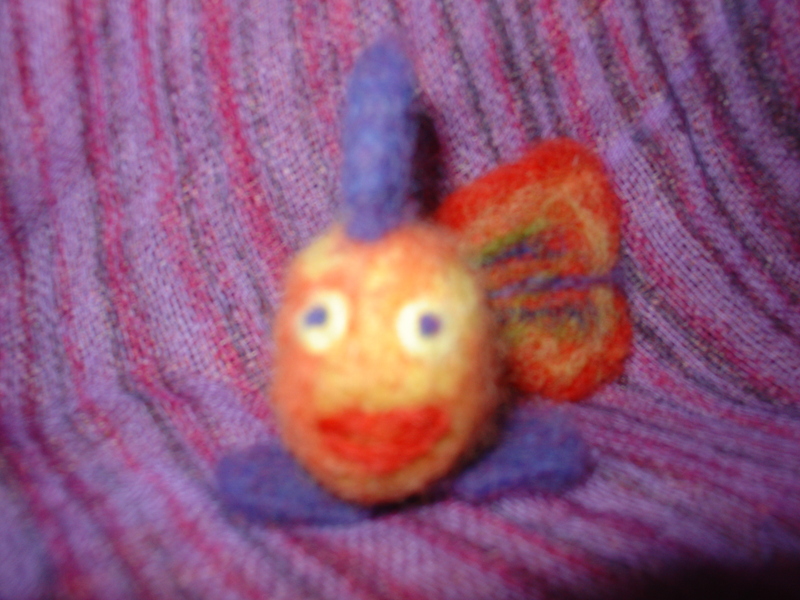 I took some photos of some old needle felting of mine. I went on a bit of a fish frenzy when I first started, based on the fish mobile in Gillian Harris’ book (see here for more on her). What are you looking at, Fish? And now for the flowers. 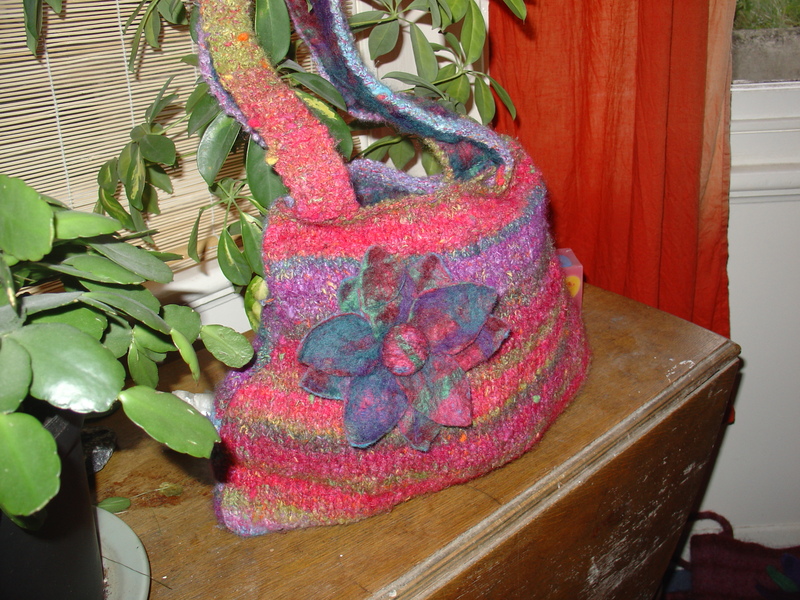 Unfortunately the best ones are in use on my Mum’s knitted handbags…I will post about them as soon as possible as her stuff is gorgeous but she’s too much of a technophobe to have a blog or Flickr or anything! Welcome to the makings of a fluff head! I’ve started this blog so that I can document and share my creative ideas. 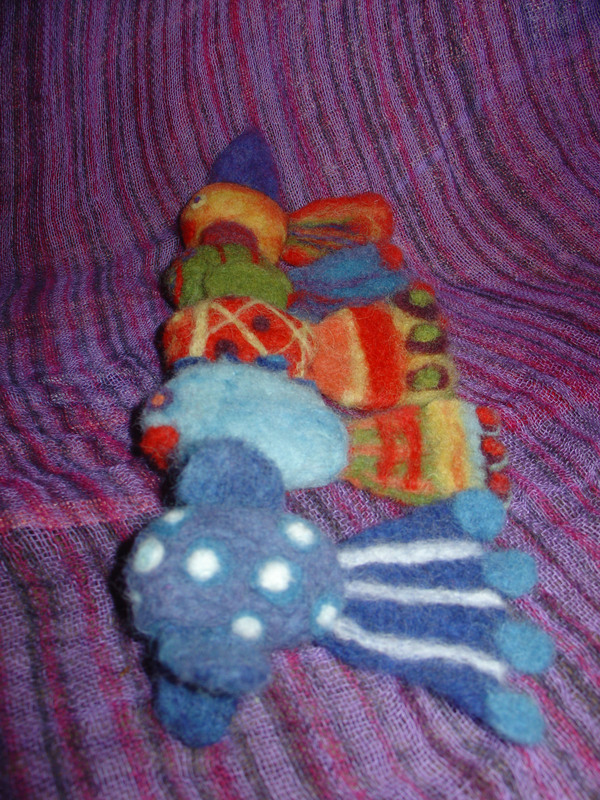 I love felting – especially wet felting, although I have been doing various crafty things all my life. My parents are both very creative, my Mum is a wonderful knitter who has just begun to get much more adventurous which is very exciting to watch unfold. She is also an inspirational cook…I still have a lot to learn. My Dad is an inspiring artist and in a previous incarnation carpenter, to be honest I’m in awe of what he is able to produce. Would be good to see more come to think of it. Anyway, they sent me to a Steiner school which really (I feel) contributed to a core grounding of good values and good, wholesome (!) pleasures. This school, a million times more than the state school I joined at 11 years old, really inspired me to learn, experience and develop. I can’t begin to explain how much I appreciate and respect the freedom we were given as children to grow and develop at our own paces. It really helped instill an appreciation for arts and creativity along with a passion for nature and learning what life has to offer us, and what we can offer too. I’ll stop there as I know I’m ranting now, sorry – back to the topic at hand. There, I embarked upon many a wooly treat. In Class 2 we learned how to hand card and spin on both a drop spindle and a spinning wheel. Later on, after feeding the lambs etc, I also hand sheared a sheep – what an experience! We all learned how to knit, producing our very own stuffed Waldorf toys (I made a chicken and a male doll with a couple of outfits). Then, other than cooking with my Mum and the arty subjects I took at school, my creativity dwindled somewhat. Much more recently however I decided to pick up a pair of knitting needles and see if I could remember how to knit. I was knitting away happily again very soon after. However, I am quite an impatient person and this seems to show even in my crafting. 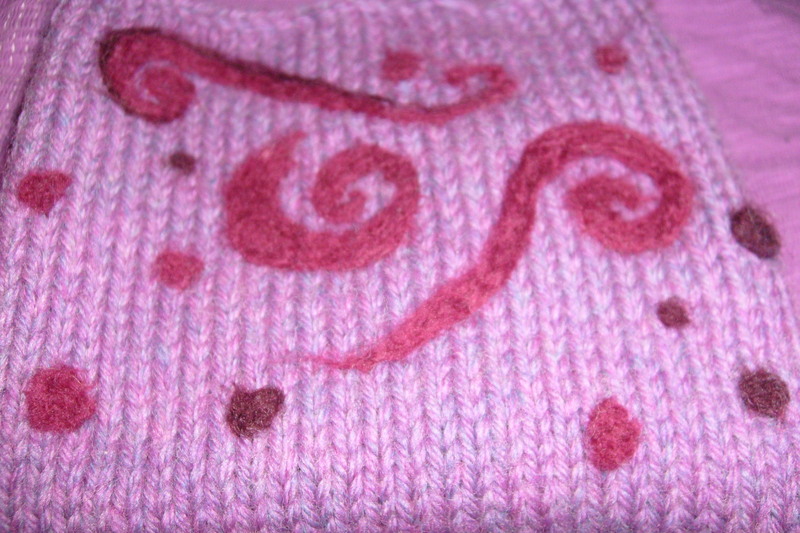 I tend to want more instant results than knitting can offer. We’re finally getting to the point here, so wake up if I’ve bored you to slumber, hehehe. I’d suggest you have a look at her website at http://www.gilliangladrag.co.uk/. Unfortunately I’ve seen some rip offs of her designs for sale on handmade crafts sites such as etsy and folksy (fantastic resources and brilliant for gifts), which is a real shame. Personally, I think it’s fair enough if you’re making for yourself but I for one would be a bit peeved if someone sold my design. For all I know though I’m on my high horse for nothing and they asked permission! The book really got my creative juices flowing. My Mum had bought some lovely naturally dyed multicoloured roving samples not long before so I got an old sushi mat, bought myself a cheap hanky and off I went. 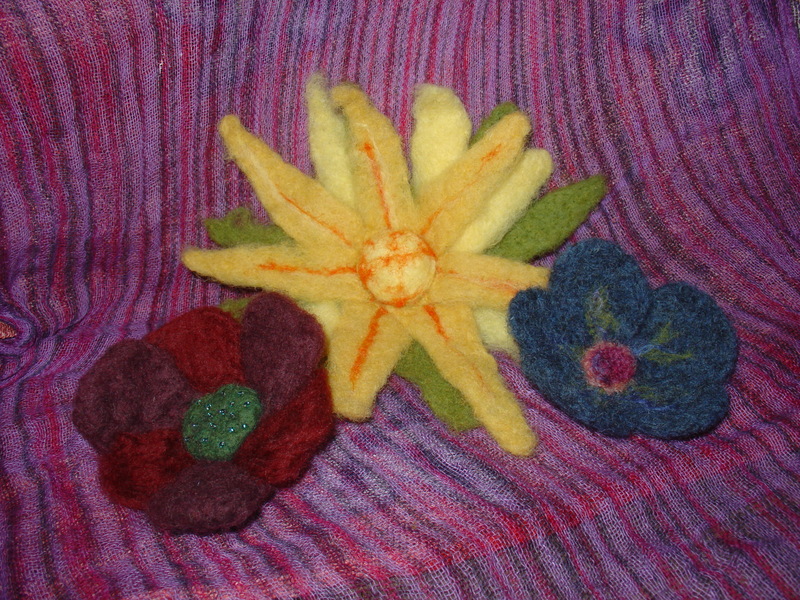 My first projects were some felted mats/coasters which turned out nicely. I also made an easter decoration consisting of small wet felted eggs in spring colours which ended up as a hanging mobile. This turned out very well and to be honest I was chuffed so it spurred me on. From there, I’ve moved on to needlefelting too – at the start it wasn’t great, with a bit of a failed attempt at an Easter card design for my Dad but I’m getting there. I prefer to mix the 2 techniques at the moment though. Maybe one day I will be as amazing as some of the sculptural needle felters out there, but somehow I can’t see it happening. Just look at these: http://www.stephaniemetz.com/ as one example! I know I’ve rambled on for more than long enough about myself now. Hope anyone reading is a very happy bunny.